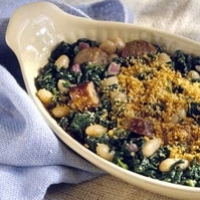 Crisp layer of bread crumbs tops a filling blend of spinach, sausage, and beans. Evaporated milk makes it rich and creamy. In a large skillet cook sausage over medium heat about 8 minutes or until no pink remains, turning often. Drain on paper towels. Slice into bite-size pieces. In a large mixing bowl combine cooked sausage, spinach, beans, onion, milk, 1/4 cup of the Romano or Parmesan cheese, lemon peel, lemon juice, nutmeg, and pepper. Transfer mixture to a greased 2-quart oval or square baking dish. For topping, in a small mixing bowl combine bread crumbs, remaining 1/4 cup of the Romano or Parmesan cheese, garlic, and melted margarine or butter; sprinkle atop casserole. Bake, uncovered, in a 375 degrees F oven for 35 minutes or until heated through.